We handcraft your Scottish Clan crest tie tack/lapel pin in high relief detail which is then completed with a high quality nickel silver clutch with chain. The Clan Crest is 11/16" (19.5 mm) in diameter with a post in the centre that holds the clutch with chain. This is a versatile piece that can be worn as a tie tack or on the lapel of coat or jacket. A must have for that proud Scot!! 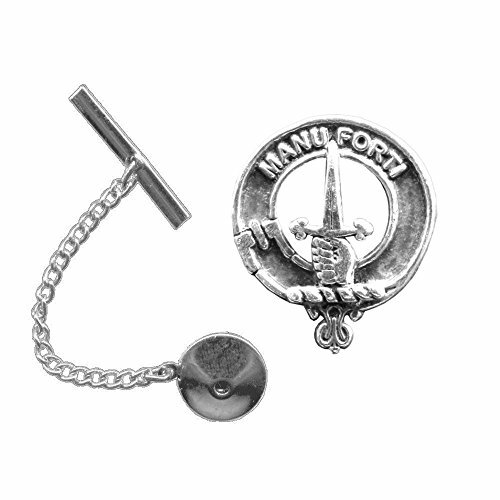 This tie tack/ lapel pin is available for all Clans in Sterling silver, 10K or 14K gold. Order now for that special Scottish person. View More In Tie Pins. If you have any questions about this product by Celtic Studio, contact us by completing and submitting the form below. If you are looking for a specif part number, please include it with your message. Ice blue atom tie tack. Forest green Claddagh tie tack / lapel pin. Black Claddagh tie tack / lapel pin. Sky blue celtic knot tie tack / lapel pin.